SAN FRANCISCO: For many years, Mercury has made its livelihood by selling traditional American full-size sedans. A few years ago, Mercury introduced the Mountaineer sport-utility vehicle to expand its lineup and to attract some younger buyers. 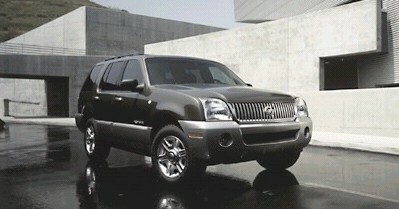 Mercury's sport utility vehicle arrived with good lineage, being based closely on the enormously popular Ford Explorer. For 2002, both the Mountaineer and Explorer benefit from a top-to-bottom redo. Changes include new styling, but also a heaping helping of mechanical upgrades, including revised rack-and-pinion steering and a beefed up frame structure. The wheelbase is longer and the track wider for better ride quality and stability. And, for safety, a side curtain airbag is now available that protects riders in the first and second rows of seats from head injury in side-impact collisions. The Mountaineer features satin finish aluminum accents inside and out. Outside, it begins with the unique waterfall grille and includes machined alloy wheels and brush guards on the tail lamps. Inside, silvery bits on the steering wheel, doors, and dash glisten in a style that was found until recently only on futuristic concept cars. The Mountaineer has special shock valveing for a sportier ride than the Explorer, and it offers an exclusive all-wheel-drive option not available on the Ford. Designed more for road safety than for rock climbing, the system sends most of the torque to the rear wheels under normal conditions, but instantly transfers some forward when needed for safe traction. It all works smoothly and without driver intervention. The old Explorer/Mountaineer platform could get bouncy and punishing in the rough, but much has changed since then. Independent suspensions front and rear take the hobbyhorse motion out of the ride, and the Mountaineer now behaves more like a tall sports sedan than a truck. Many buyers don't care to travel off-road, and for them two-wheel-drive is offered. My test unit arrived so equipped. There are no weak Mountaineers offered. The standard powerplant is a 4.0-liter single overhead camshaft V6 that puts out 210 horsepower. For more oomph, the optional 240 horsepower 4.6-liter V8 is recommended. Replacing the old 5.0-liter V8, it delivers 25 more horsepower, while using newer, more efficient technology. Despite its size and power, the Mountaineer qualifies as a low emission vehicle. Both the six and the eight cylinder engines transfer power through a new, maintenance-free five-speed automatic transmission. Fuel economy numbers posted on the window sticker are 14 city, 19 highway for the V8. Thanks to the car's computer message center, I saw that I averaged 15.0 miles per gallon over a busy week. That figure is nothing to celebrate about, but if you are hauling a family of seven, the ratio of people per miles per gallon is quite good. And, the Mountaineer uses regular gas. As high tech power plants, both the V6 and V8 can go 100,000 miles before the first scheduled tune-up. The Mountaineer does require oil changes, of course, but probably little else. That's a big money saver. The Mountaineer features standard four-wheel disc brakes with anti-lock for safety. They are improved for 2002 with larger rotors, revised linings for quieter operation, and stiffer calipers for less noise and longer wear. And, the brakes now provide more responsive pedal effort. Inside, the big news is a standard third-row seat that enables Mountaineer owners to carry seven people. The seats in the second row are split 40/20/40, and the end sections easily fold away to allow access to the third row. Behind that third row is some storage space, which expands to lots of space when the third seat is folded down flat. The rear hatch opens in one piece or you can flip open the window for quick loading of light objects. A roof-mounted luggage rack is standard. My test Mountaineer, in Estate Green with Spruce Green accents, looked and felt like a luxury car, thanks in part to a few options. The Convenience Group ($475) adds dual illuminated visor mirrors, the Homelink system, and automatic headlamps. The Luxury Group ($1,685) includes dual automatic temperature control, an automatic dimming rear view mirror, two-tone leather chairs, and upgraded alloy wheels. One truly useful option is the Reverse Sensing System ($255). In reverse, a beep starts as you approach an object (or person). The sound increases in frequency the closer you get to the item. If the beeps blend into a solid tone, the next sound you will hear is the Mountaineer bumping into something. My tester also featured optional running boards $395), which look jaunty but can transfer water to your pants as you exit the car. That is about as close as I can get to a complaint.